Makes my skin feel very hydrated. No extra benefits to my skin but hydration. I think that 2017 will be all about aloe vera for me. 2016 was a year when I obsessed about rose and lavender (and still do a bit) – bit this year I feel like the calming ingredients should calm my skin instead of my hurricane mind. So therefore I got this mask – after being in the sun the first to months of 2017 (lucky me) – I felt like my skin needed some extra hydration, and this mask was pretty reasonable priced so I couldn‘t resist. Verdict: the mask is like a fat cream. I doesn‘t irritate my skin, and you only need a thin layer. Results: very smooth, calm and hydrated skin. Just like one would expect after a fat face cream (except fat face creams usually make me break out so I prefer this mask). Doesn‘t really have a “WOW what did you do to your face you look gorgeous” effect. This is the second mask I‘ve used from this series from The Body Shop (read first review here). 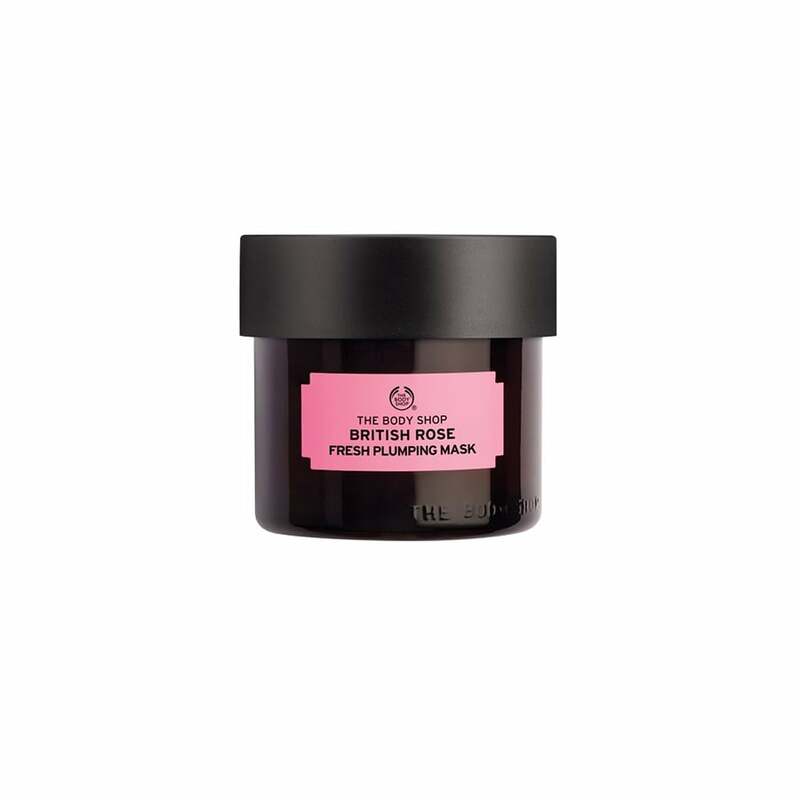 This mask contains real rose petals, rosehip oil and aloe vera. It promises to moisturise and tone your skin, and I got it thinking it could give my poor face some extra hydration (everything is dry and tired on my body right now, longing for the sun). First and foremost the mask doesn‘t really smell that much of roses, it is a bit sticky but dries in fast, and is pretty easy to remove. I have been using it about 3-4 times a week and praying for miracles. Verdict: yes my face looks more fresh, but nothing spectacular (which I feel after using my favourite flash balm for example). It‘s a good budget alternative, but definetly not the mask I would use on a spa day with my girlfriends where I want to feel luxurious and extra beautiful after layering my face with lotions and potions. It‘s decent hydration but that‘s about it. Also the whole sticking your fingers into a glass jar is just bad design. Yummy flowery smell and nice texture. Doesn‘t give you that “WOW” glow, which one hopes for. I‘m really struggling not to be too harsh to this mask, but I have high standards when it comes to “miracle glow” potions (this is my secret which I shall never stop using, no empty my wallet is). So I do expect miracles when a mask promises skin texture to appear “refined, clearer and healthier-looking”. Unfortunately my only judge this far has been my granny whom I‘m visiting and she always thinks I look like a princes (even when I have chocolate stains all over my pyjamas and haven‘t showered for 3 days), and she said I look awesome after using this mask. Back to the facts: this mask smells great of flowers, has small exfoliating particles (guarana seeds) crammed in its yelly texture and is easy to remove, not being overly sticky. Sometimes when I use it, it causes extra blood flow to my face thus making me feel extra glowing, this only happened the first 2 times though. It doesn‘t irritate my skin or cause outbrakes, which is great. Why does it only get 3 stars then? Because yes my skin looks nice and smooth afterwards, but no WOW effect, which we all crave and keep searching for. Smells natural and fresh of (pink) grapefruit. Super dry skin – give up right now and look for something else! This is my favourite body butter cause I am obsessed by grapefruit, and always looking for new things which are supposed to smell of it. Unfortunately this particular body butter never goes on sale or is sold for 5 dollars at Marshalls (yes it is true you can buy body butter from The Body Shop at Marshalls for 5 bucks and it‘s awesome), so I got it for Christmas from my mum last year. Verdict: beside from the lovely smell, it is easy to apply, dries in quick, and the smell lingers for a while. It never makes my skin feel too oily which is a bonus. The formula of this body butter is a bit more lighter then my other favourite from this range. It is only good for medium dry skin, so useless if you are shedding skin but great during the winter otherwise. Takes away every trace of make-up and is still being kind to my skin. Leaves a greasy feeling, has to be followed up with a second cleansing step. I usually just wash my face with some kind of foamy cleanser before I continue with the whole, toner – serum – moisturizer – thing. But some days when my make up is extra heavy, it doesn‘t feel like my skin gets clean enough with one cleansing step only. Using my regular cleanser twice instead results in a dried out skin. Big nono. Those days i start my facial routine with this cleansing butter instead, which melts into an oil that erases e-v-e-r-y-t-h-i-n-g. When I wash it off with water, that oily feeling is still there which needs to be followed up with my regular cleanser. Kind of irritating but totally worth it for that super clean feeling. Also, the smell is really nice, mild and floral. This is the second time I bought this cleanser, and will definitely go for a third one when this is done. A bottle lasts for ages. This is by far the best grapefruit shower gel I have ever used (this is the worst one). I have an unhealthy obsession with grapefruit and tend to irrationally purchase anything that promises a hint of this healthy fruit, in it (did you know that intakte of grapefruit interacts with a long list of medication btw – few people know this – if you want to read more check out this site ). This time I was not disappointed. First and foremost my bottle (250 ml) lasted for ages, since you only need a tiny amount per shower and the shower gel lathers really well. Secondly the smell of grapefruit lingers on my skin and in the bathroom for ages and thirdly, my skin is not dried out after use. The downside of this shower gel is that it‘s a bit expensive and that The Body Shop only put the bigger bottles on sale each season (and not the smallest sizes which are the most convenient, unless you plan on living in a pink grapefruit cloud for a shower for a few years..).